I could eat Chinese food all day every day if you’d let me. One of my fondest food-related college memories is getting to meet The Boyfriend (now known as The Farmer) at the student union for Chinese food for lunch on occasion. He would get his usual General Chicken – one of the very few chicken dishes he’ll eat. I would switch up my order every once in a while but my go-to was Beef & Broccoli with the addition of any veggies that may have snuck into his General Chicken. Those were quickly transferred from his plate to mine. Now that we don’t have the luxury of having a Chinese restaurant in close proximity to where we live in Central Nebraska, I’ve been making my own and I have to say, it’s pretty tasty and just as satisfying. And not as greasy. I’m not opposed to greasy restaurant Chinese food but it’s nice to also know my homemade versions are a little lighter. 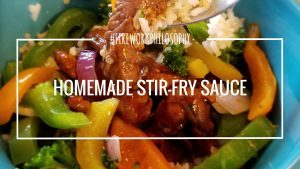 When I first started making stir fry, I use to buy the bottled sauce until I realized just how easy it is to make it at home. I haven’t done the actual math but it may end up being cheaper in the long run too because a lot of the ingredients are things you probably already have in your pantry and fridge. Plus, this homemade sauce is versatile! It’s delicious with beef, chicken, pork, shrimp and/or veggies. I usually make it with beef, because if The Farmer has to eat stir-fry for dinner, there better at least be some beef involved. I usually saute all of my veggies first, set them aside and then sear my protein in a hot stainless steel skillet and then add the sauce to the meat. Unless I’m using leftover meat. 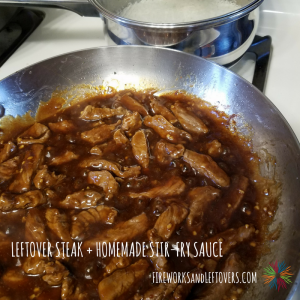 This Homemade Stir-Fry Sauce is the perfect way to use up leftover pulled pork, leftover steak, cooked shredded or cubed chicken or precooked shrimp. You can serve your protein/veggie/stir-fry options with white rice, brown rice, quinoa or noodles. What ever floats your boat. For this particular meal, I served our stir-fry with white rice and quinoa for Little E and myself and just white rice for The Farmer. Little E gobbled it down and The Farmer made sure to pick out any green plant-based additions…and then he gobbled it down. I know your family will devour it too! Forget the bottled sauce! 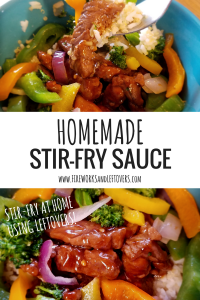 Make this Homemade Stir-Fry Sauce and use up leftover meat and veggies for a quick weeknight meal! Saute fresh and/or frozen veggies in a few teaspoons of Simply Sunflower Oil until they reach their desired doneness. Remove from pan and set aside. While the veggies are sauteing, combine the low-sodium soy sauce, water, garlic, brown sugar, rice vinegar and cornstarch in a large measuring cup. Set aside. If you're using uncooked beef, pork, chicken or shrimp, sear the meat in the same skillet you used for the veggies in a few teaspoons of oil until cooked through. If you're using leftover, pre-cooked protein, sear in the pan with oil until warm, being careful not to overcook the meat. Once the protein is cooked or warmed, add the sauce mixture to the pan and stir to coat the meat. Simmer on medium heat until the sauce thickens, about 2-3 minutes. Add the veggies back to the pan and stir to combine. Serve with cooked rice, quinoa and/or noodles. TIP: Add some crushed red pepper flakes to the sauce for some spice!